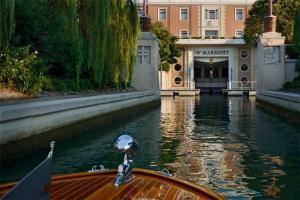 This luxurious hotel boasts a spectacular location on Isola delle Rose, a private island located in Venice, Italy. The hotel is just moments away from St. Mark's Square. Enjoy the stunning views of the lagoon and beautiful gardens and olive groves. Designed by acclaimed Italian architect Matteo Thun, the accommodations offer the ultimate in luxury and feature plush bedding, spacious bathrooms and picturesque views of the garden or lagoon. Located about 9 miles from Venice Marco Polo Airport.